Are you looking for the gift that will keep on giving well after that special day or anniversary has passed? 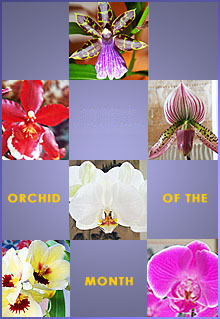 Allow us to introduce you to Beautiful Orchids' "Orchid of the Month Experience." Beautiful Orchids will provide you with the opportunity to make a one-time purchase and allow that special someone to enjoy three or even six full months of blooming potted orchids. When you sign up for the Orchid of the Month Experience, your recipient will receive their first orchid directly from our greenhouse within the next day or two. Thereafter, a new orchid hybrid will be shipped to them once a month with an exquisite gift card, your personalized sentiment, care instructions, and a premium orchid container via FREEFedEx 2 DAY PRIORITY. Enjoy! Enter first month delivery date .